If you weren’t able to join us in person at our sold out Longevity Now® Conference event held Friday, September 30th – Sunday, October 2nd, 2016, DON’T WORRY! Enjoy the conference replays from the comfort of your own home on your computer, laptop, Ipad, or favorite mobile device with access to UNLIMITED REPLAYS of the entire conference until October 15th, 2017! Watch the presentations at your convenience – whenever and wherever you like! Don’t miss YOUR chance to absorb information from best-selling author and host of the Longevity Now® Conference David Wolfe, and some of the most brilliant and innovative health visionaries in the world including: Best-selling author and natural healing authority Dr. Joel Fuhrman, Best-selling author and relationship guru John Gray, Best-selling author and nutrition expert Dr. Joseph Mercola, Best-selling author and adrenal health expert Dr. Alan Christianson, Guinness world record holder Wim Hof, Master trainer Joseph McClendon III, Brain performance specialist Jim Kwik, and many more as they share life-changing information that will help YOU take YOUR health to the next level! For the past 21 years, I have been traveling all over the world passionately sharing the latest cutting-edge research and advances in nutrition, brain and memory function, tonic herbalism, anti-aging, and yoga & meditation. In my travels I have met tens of thousands of people, from different walks of life, that all on some level wanted to make a change in their life whether it be improving their diet, increasing their energy and endurance, having less stress, preventing disease, detoxifying, or simply dropping a few pounds. I discovered that the best way to help people achieve their health goals is by empowering them to take charge of their own bodies by giving them access to the most up-to-date, meticulously-researched information that is simple to understand, easy to implement, and most importantly FUN! It is for this reason that I created The Longevity Now® Conference, an event where I hand pick top experts in the fields of alternative health, anti-aging, longevity, and nutrition that I most trust and admire to deliver the best information that will help you maximize your full potential to experience extraordinary health and well-being. Now is the time. 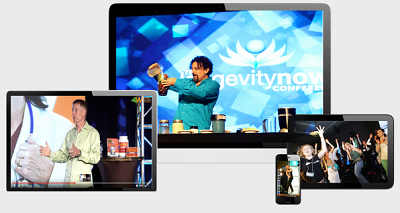 I invite you to be a part of The 2016 Longevity Now® Conference Webcast Replays!